Adding recommendations to your transactional emails turns them into an active sales channel. That’s three emails that can be used to bring the customer back into your webshop and once they’re back, they’re already on their way to convert again! The transaction receipt will contain information on the customer’s interests which you can use to create recommendations on more products they may be interested in. The emails will be sent anyway so why not turn them into something beneficial. Plus, once setup is complete, the recommendations are fully automated. 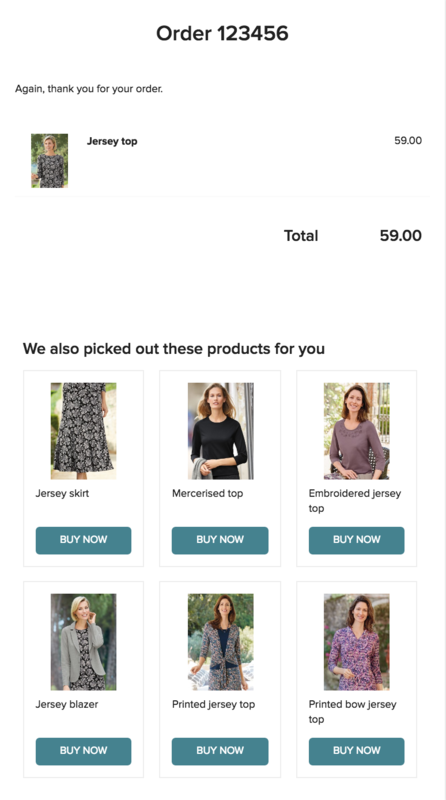 Most webshops tend to increase their revenue by using little tricks like this, so keep it in mind when setting up your transactional email flow. Simple order confirmation mail with recommendations.